Two limited edition vintage sets from Château Haut-Brion are to be auctioned online with the proceeds going to charity. Valued at US$460,000, bidding for the two “consoles”, one with red vintages, one with white, ends on the luxury auction site charitybuzz.com this Friday 14 October. 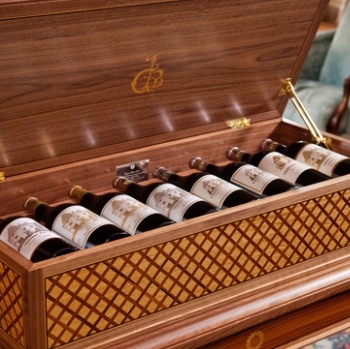 In total 20 “consoles” have been made – 15 red and five white – which represent a collaboration between Prince Robert of Luxembourg, president of Domaine Clarence Dillon and furniture maker Lord Linley and are made up of wines that have never left the estate’s cellars. Prince Robert and Linley worked for two years on the project to produce the cases, each of which holds eight bottles and includes silverwork by Italian jeweller Buccelatti. The red case for the auction includes the vintages 1935, 1945, 1959,1961, 1975, 1989, 1990 and 2009. 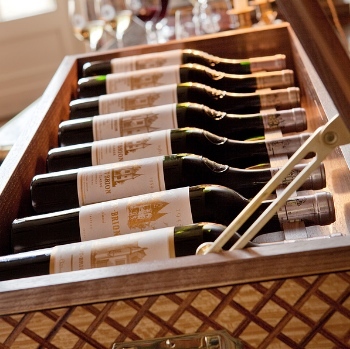 The bottle of 1945 is one of only seven bottles remaining in the château’s cellars. The white console includes 1969, 1976, 1983, 1989, 1994, 2003, 2005 and 2007. The buyer of the two consoles will also receive another case containing two decanters and 12 glasses all decorated with the monogram of Domaine Clarence Dillon. As 2010 represents the anniversary of Haut-Brion, the buyer will further receive a case of six red and six white wines from the 2010 vintage.